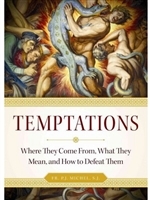 Temptations: Where They Come From, What They Mean, and How to Defeat Them by Fr. P.J. Michel, S.J. God Alone Suffices by Slawomir Biela - Catholic Spiritual Book, 155 pp. The Spirtual Life-- A Treatise on Ascetical and Mystical Theology by Adolphe Tanquerey, S.S., D.D.